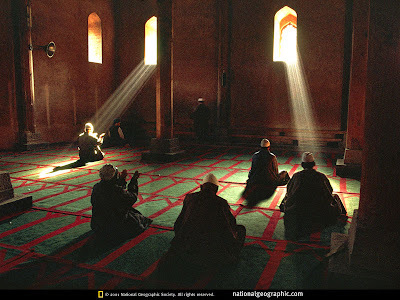 The Quran: Fatiha (1:5) Thee alone do we worship; and unto Thee alone do we turn for aid. Ghafir (40:13) HE IT IS who shows you His wonders [in all nature], and sends down sustenance for you from the sky: but none bethinks himself [thereof] save those who are wont to turn to God. Ra’d (13:28) those who believe, and whose hearts find their rest in the remembrance of God - for, verily, in the remembrance of God [men's] hearts do find their rest. It is important to get close to God first before we ask Him for whatever we want. We need to get close to Him until you ask Allah as though you see Him. In order to achieve this closeness with God, you first need Peace and Tranquility. The first step to tranquility in your heart (Sukoon) is by regaining your breathing. When the breath is not coming through properly, we need to reconnect again and become aware of our breathing patterns. Try not to do anything without a connection to God or do anything without breathing properly. We won’t be able to do anything properly without a connection to God. When you have trouble breathing, we have broken our connection with God and it is important to regain the breathing as soon as possible. Try not to engage in ibadah (worship) if you are not in a state of spiritual balance. Only those who remember God have a spiritual balance. Watch your breathing and be thankful of all your breaths. Real dhikr is having consciousness of your breath, the level of your breathing consciousness is the level of your dhikr too. Take in the dhikr and give it out too. Remember that everything you get in life is nothing compared to the life you have been given. People are thankful for houses and cars, but these are secondary blessings to the first blessing of life. This is Allah’s first blessing conferred on you. If you were never alive, you wouldn’t be thankful for even all the secondary blessings. Remember God by thanking Him for just be-ing. What is the most fundamental in life is just being alive. You Remember Me and I will Remember You (2:152). Have continuous remembrance and your life will increase. Rabbi Zidni Ilman (Lord, Increase me in knowledge 20:114). The dua’a of Prophet Moses (peace). We only have a small bit of knowledge compared to the knowledge we can have if we engage in true remembrance of God. And your knowledge will increase. If your heart is not tranquil, it will become blind and ignorant. The eyes do not go blind, it is the heart that goes blind (22:46). Everything depends on the condition of the heart. Only in the remembrance of God do hearts find rest (13:28). When the heart is in peace, then it opens up. Remembrance of God can only come in tranquility. You have to have stillness, quietness, and be conscious of your pattern of breathing to be tranquil. Dhikr and Fikr are both activities of the heart. Dhikr is remembrance of God. Fikr is reflecting on God’s creation. You have to get Dhikr first, before you can reflect on Allah’s creation and His signs. You cannot get Fikr without Dhikr. You need to know the Creator first and then get to know Creation. Nothing is created in vain, everything has a purpose (34:46). Be still for God. Ponder and reflect the connection of Creation to God later after Dhikr. There are many ways to reach this remembrance. One way is to get a name of Allah from a teacher and keep saying it with his instructions until it reaches your heart. The system then of breathing is important in this type of Dhikr. The Angel Gibral (upon Gabriel be peace) linked the Prophet (peace) on 3 levels. Remember the Angel squeezed the Prophet (peace) three times and each time asked him to recite Surat Alaq (39:6). Humans were created in 3 darknesses. Each darkness is taken over by a light. Your duty is to work on each darkness, when you cut one, you go to the next one. That is the wisdom of why we do everything 3 times (for the 3 darknesses). As long as you are in remembrance, Allah keeps blowing in a new spirit. The soul is individual whereas the spirit is universal. People usually don’t want to give the nafs away freely. They do not go for the universal spirit. The 3 darknesses tend to overpower the spirit but it really should be the other way around. Also, the 3 darknesses shouldn’t go away, rather the spirit should dominate and be the guiding force. Most of us don’t feel the darkness around us, but once we know what is beyond it, we cannot live in darkness anymore. Surat Hujurat, the whole surah, has invaluable advice on Adab with Allah and His Messenger (peace) and then Creation. For example (49:11) don’t be self-righteous, don’t stigmatize, do not brand others, do not give nicknames that have an underlying insult in them are all listed in the Surah and more. Kufr (disbelief) this is overtaken by Islam (submission) Fusooq (sin) this is overtaken by Iman (faith) Eysaan (disobedience) this is overtaken by Ihsan (or ta’a or ibadah) (worship Allah as though you see Him). may Allah bless Imam Fode Drame's path and enable him to enlighten more souls. Thanks and blessings to friend Andrea Mau, a student of Imam Fode for sharing this note with me and hence with you all. note: surah or surat means each chapter of the Quran, the Final Revelation to mankind.